With the weather being as beautiful as it has been this past week or so, I thought i’d take full advantage and shoot a few outfit posts as it’s been a little while since I posted my last outfit, and i’m missing adding a bit of fashion content into the mix. I thought i’d show you one of my favourite pieces for Spring and how I like to style it up, and put a casual yet classy spin on it. Last summer I absolutely loved rocking a good bardot top, and with them set to be another big trend this summer I’ve already started stocking up on a few to style up. For me I just find them so easy to wear and they work for any occasion, whether it be a chilled day shopping or getting glammed up for an evening of drinks with the girls, they are limitless with what you can do with them. A recent addition into my wardrobe is this beautiful Floral Embroidered Off Shoulder Top* (£19.96) from Zaful, which i’ve been eyeing up quite a bit recently. I absolutely love the embroidered detailing to it as it adds a lovely yet subtle bit of interest and the light blue colour as it switches it up to my usual monochrome pickings. The fabric of this is also really nice, as some embroidered tops can become a bit stiff and scratchy, yet this it still really light and drapes really nicely when styled untucked. In typical Charlotte fashion, i’ve been styling this with my Topshop Jamie Jeans (£40) as I literally live in these as they are so comfy and so flattering. 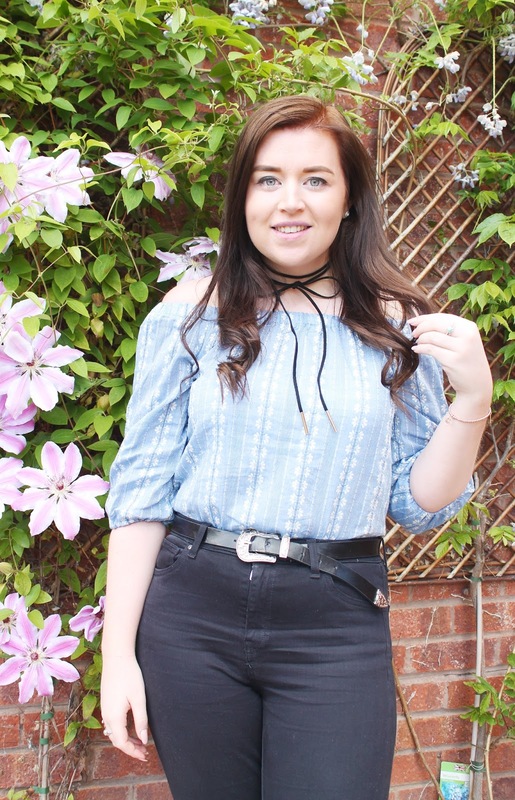 I’ve been styling these up with this Vintage Style Western Belt* (£4.78) for the past few weeks and i’ve been wanting to get my hands on one of these belts for such a long time. 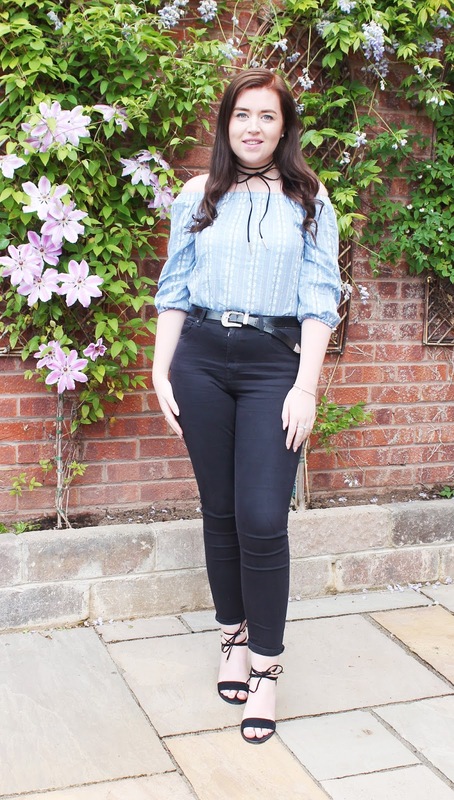 I love it as it adds a small amount of detail to any outfit, especially when it comes to styling these jeans with a more cropped fitting top. Another massive trend at the moment that I was a bit skeptical about getting on board with was the choker trend, mainly because I thought that they’d just enhance my many chins. However I have been really liking this bow choker from this Choker Necklace Set* (£3.62), as it’s easier to style up and adds a really cute touch to any outfit. For a more classy option, I decided to style these up with my favourite heels at the moment these Tie Detail Block Heels which I nabbed for an absolute bargain in the River Island sale. Unfortunately they are no longer available, but I absolutely love them as they aren’t too high and they are so easy to style up with any outfit. What on trend pieces are you loving at the moment?